Canberra being such a recent arrival on the planet and the fact that I have lived in this young town for most of my life builds a sense of awe in the presence of old stuff. 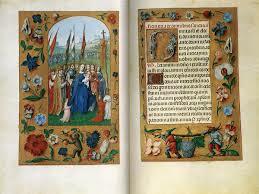 The current exhibition at the National Library of Australia centres on manuscripts that are half a millennium old. Revealing the Rothschild Prayer Book c. 1505-1510 from the Kerry Stokes Collection is an exhibition centring on a remarkable book with a fascinating provenance. The exhibition has some historically interesting accompanying text and other documents around the walls and in cases. The heart of the exhibition is a large flat screen on which in high definition page after page of the book are projected in large format. It was a marvelous experience to see such gorgeous creative beauty that had been generated over 500 years ago. This entry was posted in Ancient artifacts, Art, Calligraphy, Canberra, History and tagged Kerry Stokes Collection, National LIbrary of Australia, Revealing the Rothschild Prayer Book by stephenrrandall. Bookmark the permalink.